INDUSTRY.co.id - Surabaya - President Joko Widodo asserted that micro wakaf bank can solve a number of problems faced by customers in conventional banking. "Micro-endowment banks should be able to solve problems that cannot be resolved by the banks, because if they want to borrow to the bank must have collateral and new piles of administration can be to the bank," said President at Pesantren Assalafi Al Fithrah Surabaya, Friday (9/3)/2018). President Joko Widodo conveyed the matter in the launch of micro wakaf bank in the pesantren. 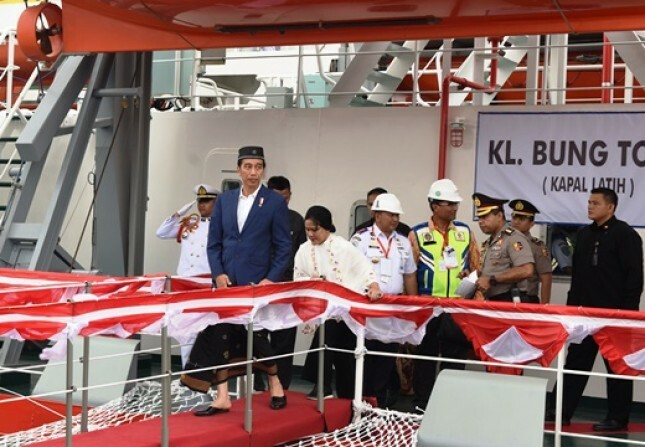 The event was also attended by Mrs. Iriana Joko Widodo and Chairman of the Board of Commissioners of Financial Services Authority Wimboh Santoso. "In the bank there is also a considerable interest, if the wakaf bank is only charged operational costs and administrative fees three percent per year, not per month.If the mothers want to borrow Rp2 million please go to this wakaf bank, either to develop a home business ladder or for additional working capital, to open the kiosk which is served by wakaf bank, "explained the President. So why micro wakaf bank built in boarding school? According to the President because he wants the students can learn to manage banking. "So if the bank is getting bigger God willing bigger, economy people can run well, our hope it," said President. He also stressed that the government is not only taking care of the big investors in conventional banking. "For what built a wakaf bank is built? I do not want to take care of the big ones, I also want to take care of the small ones although later the small office is okay, the capital is also approximately Rp 8 billion is okay. build a micro-waqf bank donated from Datuk Tahir, thank you datuk," added the President as quoted by Antara. Micro Waqf Bank is expected to provide access to capital or financing for people who have not connected with formal financial institutions, especially in boarding schools that currently number more than 28 thousand boarding schools in Indonesia. Until the beginning of March 2018, from 20 Micro Waits Bank which is a pilot "project" has been channeled financing to 2,784 customers with total financing amounting to Rp2, 45 billion. The financing scheme through Micro Endowments Bank is non-collateral financing with a maximum value of Rp 3 million and a profit margin of 3 percent. In addition, in the financing scheme of Micro Wakaf Bank also provided training and mentoring as well as financing patterns made per group or joint responsibility. This institution is not allowed to take savings from the community because it has the focus of community empowerment through financing accompanied by business assistance. This institution also has status as a Sharia Micro Finance Institution licensed and supervised by OJK.